There are very few pieces of equipment that fill me with as much joy as my signature series Ultimate Directions race vest. 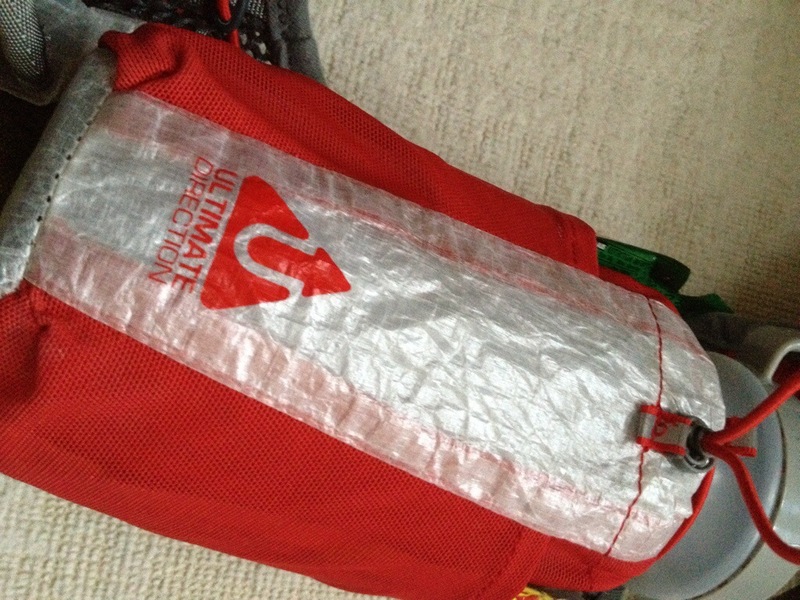 Perhaps my Hoka, maybe my original Adidas Adios or maybe my first OMM 25l bag but these all felt very real, things that could be used in a day to day scenario either for training or going to work, the UD Signature Series doesn’t feel like that, the UD vest feels like something you wear when you are racing or hitting the ail big time. I’ll point out that I am a regular user of the vest but there is something that makes you heart skip a beat when you put on a piece of kit like this because it helps get you into the zone. Anyway enough of my gushing, this is a very simple review based on my experiences with the UD Peter Bakwin signature series vest. I’m not a professional athlete, I’m not even a decent ultra runner but I run regularly, race often and want good, value added kit to ensure that my collection steadily grows. – Bottle holsters can carry 26 oz. I specifically bought this bag a a replacement for my OMM Ultra 15, which as a bag I love to bits but as a race bag it sits quite low on my frame and I find the need to have a map pouch permanently attached to me which makes the bag difficult to remove during a race – so much so that during the White Cliffs 50 I need the aid of some of the support crew to help me back into my bag. Let me make it clear though, my OMM 15 is my current daily use bag and often my first choice race bag, but for the ultra distances I felt I needed something that reduced movement event further, was lighter and built specifically with the ultra marathoner in mind. My search was extensive and I looked up bags and vests from manufacturers like OMM, Salomon (whose range is outstandingly good), Nathan and even Decathlon. It was while looking for new and interesting races that I stumbled across the Centurion Running website and there was a fairly small but well packed shop with goodies just destined for my basket – but the thing that caught my eye where the Ultimate Directions race vests. Not only where they in the same price bracket as the Salomon but they had a rather nice colour way that made me think they’d look rather nice on. The fact that the bag was jammed to the rafters with technology and innovative features was simply a bonus to me. I made my order from Centurion Running as they were offering it at both a decent price and my fellow tweeter @abradypus recommends them and their events and as a consequence I wanted to support an organisation doing good things rather than give my money to taxation specialists Amazon. It arrived very swiftly but like the muppet I am I had ordered the wrong size – bugger. But credit where it is due centurion simply took back the item and replaced it with the M/L version which I knew would fit me right in the sweet spot – and that is a not a euphemism. Of course I was keen to try it the moment it arrived but I tend to carry a lot into work and the 8litre capacity of the main compartment probably wasn’t going to be enough – so I waited patiently for the weekend and on the Saturday morning set out for my long slow run, I say long it was probably about 20 miles but enough for me to consider that I would need to take liquid with me and a few bits of kit like a waterproof incase the weather turned heavy on me during the height of summer. I put the pack on, fiddled a little with the two small front clips and a slight adjustment to the single cord tightening system and I was ready. The first things I noticed was that vest was tight to my back and by tight i simply mean that it didn’t move, it used my form and followed me, even when loaded it remained a balanced pack and there was no bouncing around. Adjustments are simple to achieve too once you’ve got the hang of not having dozens of straps floating about and it is in this quality engineering that you can see that Ultimate Directions have really thought about how the back is going to come together. 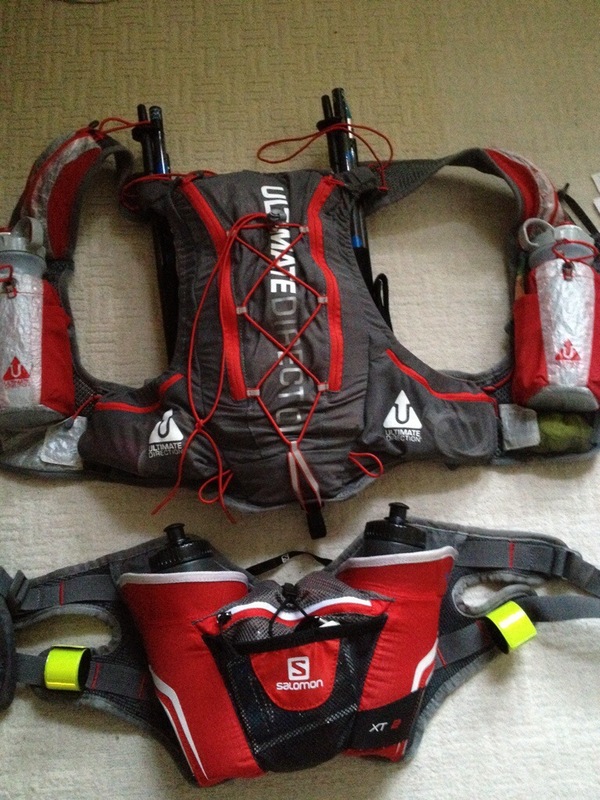 I added my two water bottles to the front of the vest and filled each of the pockets with suitable items and set off for a great run. The truth is that I barely knew the bag was there. My one complaint was that I couldn’t figure out how to get the water out of the bottles and had to unscrew the buggers, a nuisance but more down to user error than anything else. Upon returning home I was able to strip the pack down a bit and start kit testing for the Thames Gateway 100. Despite being an ultra runner I tend to carry too much stuff, I prefer to be prepared and carry a few extra items rather than drop the weight I’m carrying but sacrifice essential items. The back of the pack was perfect for this, straight in went my Montane minimus jacket, first aid kit, head torches, iPad mini! spare socks, arm warmers, mobile charging device, maps and waterproof trousers. In the outer mesh I was able to place a small wind proof jacket and had I really needed it I could have added another small item of clothing to the compression straps that run over the back. Into the side pockets I added a buff, some electrical cables such as my Garmin and iPhone charger and a little bit of food. more food was added to the side pockets of the water bottle front pouches and I still had room for my mobile phone and further food stuffs. 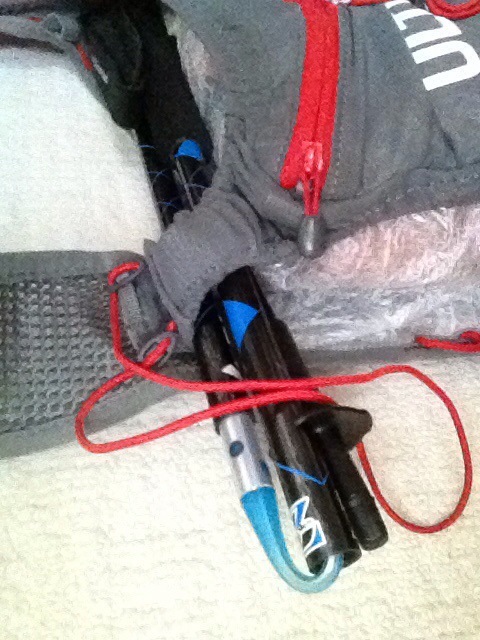 Still though there was a bit of room … UD say they have built in a space for ice axes and cheat sticks/hiking poles but I use the Black Diamond Z pole which are not telescopic and so are reasonably bulky. However, using the two side pockets and flicking the cheat sticks under the straps means you can have your cheat sticks to hand. Interestingly even fully loaded the bag feels lightweight, good on the back and most importantly comfortable. It was perhaps the one good thing that came out of my DNF at the TG100 that the bag came through we flying colours and solved the problem of me being able to take off my bag whenever I wanted to. There are so many twists and loops on this pack that you think you will never actually fill them all, but it is a testament to the team who put this together that they know what runners want and need that nothing feels wasted. A brief note on the water bottles is that they like the bag are fantastic, they feel clean, taste good and the grip is excellent. The issue I had was that I neglected to pull the water feeder up and therefore found it difficult to get water out on my first trial of the pack – a brief internet search put me right and am convinced that these bottles are possibly the best ones I own. I’ve seen some reviews that say the gel pockets on the side of the bottle pouches can ping the gels out but I didn’t find this but then I would be more likely to store biscuits or jelly babies in there. I’d love to find a downside with the pack but simply can’t, perhaps the fact it isn’t waterproof would be an issue for some but then you have to balance weight against materials used and I think the Ultimate Directions PB is a perfectly balanced pack. The pack is available for many good online retailer such as the Centurion Running. Enjoy.